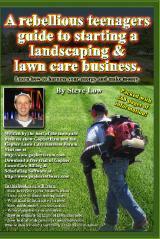 New Lawn Care Business Website SEO Book Available. 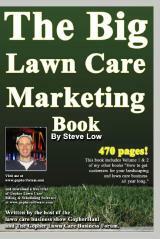 I am happy to announce the release of my newest lawn care business book. The Pro Lawn Care Business Playbook. You can order it here in both paperback and kindle version. Why isn’t my phone ringing? 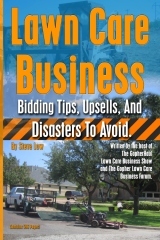 New Lawn Care Business Book - Lawn Care Business Bidding Tips, Upsells, And Disasters To Avoid. 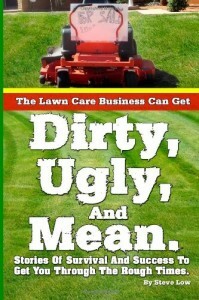 New Lawn Care Business Book. New 224 Page Lawn Care Business Book. 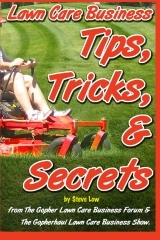 Lawn Care Business Tips, Tricks, & Secrets book ranked #1 best seller on Amazon. If you are looking for ways to better improve your lawn care business operations, order my book Lawn Care Business Tips, Tricks, & Secrets From The Gopher Lawn Care Business Forum & The GopherHaul Lawn Care Business Show. It’s available in paperback and has an electronic version for the kindle reader. New Book - How To Get Commercial Lawn Care And Snow Plow Customers. 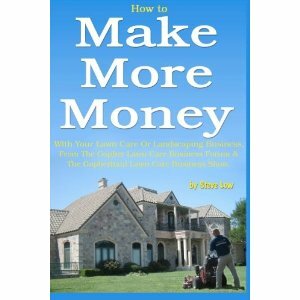 Hot off the presses, get your copy of How to Make More Money with your lawn care or landscaping business. From The Gopher Lawn Care Business Forum & The GopherHaul Lawn Care Business Show. The price is discounted for it’s new release so jump on this offer now. The GopherHaul guide on how to get customers for your landscaping and lawn care business - Volume 3 is now available. Anyone can start a landscaping or lawn care business but the tricky part is finding customers. This book will show you how. New lawn care business book: What the hell are you doing with your life? 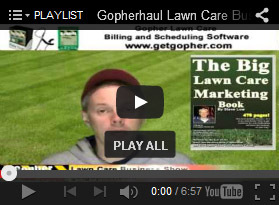 GopherHaul Extreme Lawn Care Business Tips. New Book! 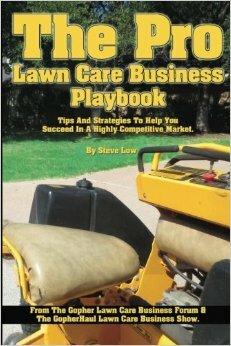 Here is my latest lawn care business book. GopherHaul Extreme Lawn Care Business Tips. - Unfiltered, unedited, and a little rough. 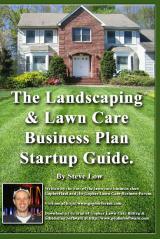 A collection of landscaping & lawn care business lessons. The danger of large lawn care accounts. We had an interesting discussion on the Gopher Lawn Care Business Forum on the topic of lawn care business loans. How to price and trim hedges. Trimming hedges quickly and easily can be tough along with coming up with the right price for your lawn care bid. Let’s look at this discussion from the Gopher Lawn Care Business Forum and another post here on how to price and trim hedges. First off I’d like to say hi to everyone after this summer’s hiatus from producing the GopherHaul Show. There has a lot that has been going on. 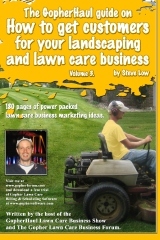 New lawn care business book now available. 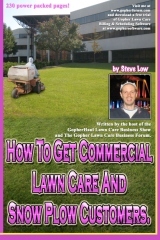 Gopher Lawn Care Business Software User Manual now available. The new Gopher Lawn Care Business Software User manual is now available. In debt and just getting my lawn care business started. What should I be advertising? Tips on how to market to commercial lawn care clients. Getting your foot in the door is an important step when you are marketing to commercial clients but how should you go about doing this? Lawn Care Customer Retention. Why are your customers leaving you? The most asked lawn care and landscaping business questions answered by professional entrepreneurs. Be in my next book! I am putting together my next book which is going to be an episode guide of my lawn care business show GopherHaul. My new book, Stop Lowballing is now available on Amazon! I am really excited about this. My new book “Stop Lowballing! 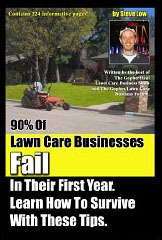 A Lawn Care Business Owner’s Guide To Success” is now available on amazon.com. if you want to get a print version of the book, you can now order it here.